Raise your hand if you have a two-car garage and can’t fit your cars into that garage because there are too many bikes, scooters, tricycles, hula hoops and Cozy Coupes littering the floor? That’s what I thought. Please note that I am NOT raising my hand, because both of our cars fit into the garage and the bikes are parked in this nifty bike rack! (Feel free to applaud.) Do I feel smug? Why, yes—yes, I do. 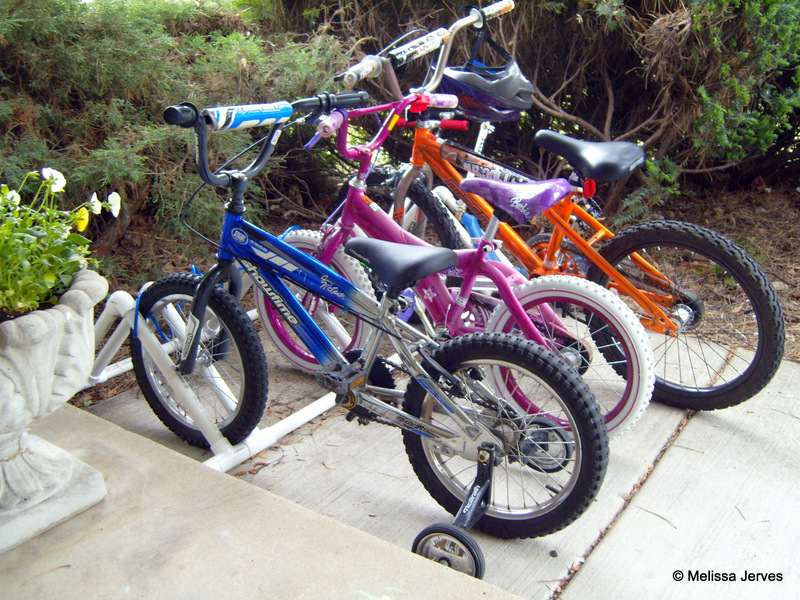 In the winter, we hang the bikes from hooks in the garage ceiling, but in the summer months, the kids need to be able to reach their bikes. Finally, it occurred to me that we needed somewhere besides the garage to park and lock the bikes; you know, like in the bike racks at school. Why couldn’t we have a bike rack? 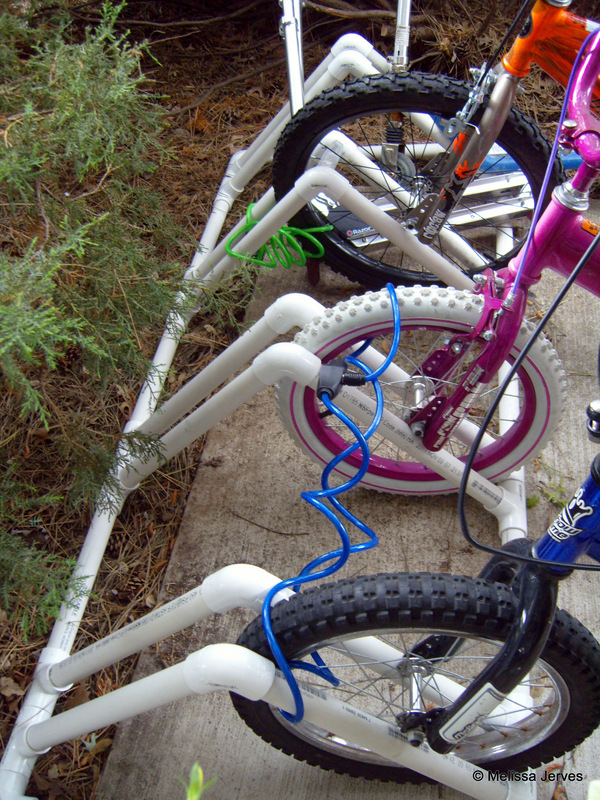 Normally, I would search Google and Pinterest for “DIY bike rack.” But before I got around to that step, fate stepped in. I was reading the great craft blog I Am Momma Hear Me Roar, and Cheri posted a link to a bike rack project! Thanks to Kristen from Hostess with the Motzes, I could stop thinking and just follow the directions. Miss Six and Mr. Nine accompanied me to Home Depot to buy the pipe. While I balanced the 10-foot lengths of PVC pipe on my shopping cart, they carefully counted out all the elbows and T-connectors we needed. At home, Mr. Nine measured all the pieces and even took turns cutting them with the hacksaw. Finally, with the help of a rubber mallet, we assembled the rack (the fun part!). I should note that this is a perfect project to do with a kid. The measuring and cutting does not need to be perfectly precise or straight, and it doesn’t take too much strength to cut the pipe with a hacksaw. But what would a DIY project be without some kind of glitch? I knew exactly where I wanted to put the rack alongside the front porch, but I neglected to measure the space and compare it to the measurements of the rack before we started. Soooo…the beautiful 5-slot bike rack didn’t fit in our space. The fix was easy, though, since we skipped the PVC cement when we assembled the pieces (being able to disassemble the rack for storage sounded like a good feature). I just popped one end off and removed one slot, turning five slots into four. Still enough room for three bikes and three scooters, and a perfect fit. That’s fabulous. What a great project. It’s too bad you didn’t have enough room for all the bikes, though. We did, though! 3 kids, 3 bikes. Those little Razor scooters easily fit propped between the bikes, and there’s a 4th space for a friend’s bike. Thanks for the mention! I am so glad you liked it. I am loving that you are able to keep your bikes OUTside and your cars INside your garage. Thank you for your clear instructions! My son was so proud that he helped build it! Super idea! I love how you dove right in and tackled it. Inspiring. You’ve earned the right to be smug…such a great idea! That’s fantastic! We are so making one of these!!! I love when things come together like this. You have a dream, you find a link! Turned out terrific too. 😦 the blog to the ‘Hostess’ isn’t there anymore. Did you happen to save the directions? ?